Bernward Koch is an internationally renowned pianist, despite not being introduced to the instrument until he was 15 years old. Having originally focused on other instruments, including the French horn and trumpet, Bernward went on to study music at a University in Cologne. In 1989, he released the highly successful album Flowing, which later was released world-wide on the Real Music label. Several albums followed, including Journey to the Heart and Walking Through Clouds- both albums achieving critical acclaim and an International release on Real Music. Bernward's latest CD, Montagnola, is a highly personal, semi-biographical and semi-autobiographical musical exploration of the famous German novelist Hermann Hesse. It achieved ‘Piano-Heaven Gold Status’ in May 2008. Bernward kindly agreed to an interview exploring the thinking behind this fascinating album. 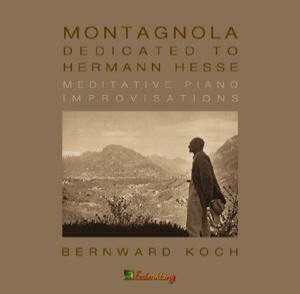 S.C. Congratulations, Bernward, on your stunning new album, Montagnola which is dedicated to Hermann Hesse. I'm sure there are many people you admire, so what is it about this novelist, poet and painter that has impressed you so much? B.K. Thank you very much! Well, Hermann Hesse (pictured below right) was the first writer who I found truly inspiring, and he opened my eyes to "other" views of life. During the recording session, when I was improvising in an isolated room, I had flashbacks to Hesse. I thought the music was very befitting, and so I dedicated this album to him. When did you first become interested in Hermann Hesse, and what sparked that initial interest? Through researching him and the works he produced, has he impacted upon your life- i.e. have you learned anything about yourself or life in general? I'm also interested in the back cover of your CD in which this quote appears, "The dedication of the album... is to be understood as a symbolic fresh start..." could you expand on this a little? The first novel I read by Hermann Hesse was when I was 19. It was Siddhartha- an Indian tale. It was such a powerful experience, like with music, but in a different form. I learnt life could be more than just a "normal" life; to be free is a very important thing, especially to have inner freedom. And, Hermann Hesse was a very individual person- very independent in his thinking. Montagnola is the name of a place- a small village near Lugano in the south of Switzerland- where Hesse made a fresh start in life after the First World War in 1919. For me, life has felt like a treadmill sometimes, so I too have made this new start. I enjoy your CDs very much. Typically, they include electronic embellishments (i.e. use of synthesisers), but these are conspicuous by their absence on Montagnola and you have opted for solo piano. Why was that? (Incidentally, I think the work is all the better for it). Yes, the Montagnola album is not a typical studio production, just live improvisations on a grand piano, recorded during special moments in a special room, "without a net". I very much like to work and record in the studio with synthesizers, keyboards and many other instruments, but in this case, I felt I must try this new way, to achieve the outcome I wanted. Thank you- indeed it is. I visited the monastery at Maulbronn (right and below right) regularly for a couple of years; it is a world like in medieval times, and I felt like I was in the past. When I played this track during the recording, it suddenly reminded me of standing between the ancient walls and stones at the Maulbronn monastery during my visit. It was a contemplative moment where time seemed to stand still, actually like during the whole recording process for this album. I remembered that in this place, Hermann Hesse tried a mysterious escape in March 1892; one of the early ideas for his novels, “Narcissus and Goldmund” and “Beneath the Wheel” (like Hesse’s novel "Steppenwolf", the inspiration also for the US rock band). I must ask you about Playing Children, which is unusual because it lasts just 35 seconds! I know Hermann Hesse had a difficult childhood- he ran away from home, he tried to commit suicide and indeed at one point was placed in a Mental Institution. I am probably reading too much into this, but I was wondering if the length of the track was representative of the lack of happiness within his upbringing- or is the track about something different altogether? Well, the inspiration for this track came when I "saw" playing children in a hidden alley. They were uninhibited and imaginative, and the place could be the city of Calw during the 1880s- Hesse’s birthplace in the Black Forest. So, you had "spiritual experiences" during the making of this album? Is that correct? Yes, it is. But it's not easy to describe that feeling. In addition to that experience, I had some very special moments; a mixture of concentration, contemplation, meditation and nothingness, especially during the playing of the tracks Montagnola, Waves of Time and Dream. I think it is basically impossible to repeat those special moments. You were telling me a little about Snow is Coming. It's a lovely little story- perhaps you could share it with us. When I was sitting at the grand piano during the recording session, I looked out of the window and saw snow blowing down from the hills; within seconds it was covering the whole air, and simultaneously the keys of my piano became those dancing snowflakes. Yes, it is a combination of both. But it is the impression his work has made on me too; he can express things that would normally be impossible to say in words. I very much like so many writers, not only classical authors, and Hesse was my first. I'm also intrigued by the fact that these tracks are improvisations. There are different degrees of improvisations, ranging from a one-take completely spontaneous recording errors-and-all, to an improvised theme which is then explored further and "perfected" before the recording process. Could you talk the readers through your preferred recording process in this album? In fact, I sat at the piano without any ideas. It was a risk, but one that I felt I should take, like a live concert in a wonderful atmosphere. The recording room was the Ratssaal at the town hall in Wenden, NRW. There is a very pleasant sound in this cherrywood boarded room with a nice view of a green valley. Only the recording engineer (Sebastian Meyer) and I were in the whole building, so we had the right silence and the best ambience to get my full concentration with the keys, to channel the music. Fountain is amazing; a real rush of energy for forty seconds! How did this piece come about? It’s simple; sometimes I just like to play the piano with only the black keys in a pentatonic scale. It sounds like a harp and reminds me at sparkling water. My other two favourite tracks on your CD are Dark and Black and White, both of which I find very beautiful. Can you give the readers some insight into the thinking behind these wonderful pieces? I think the music you have composed for this album is probably the very best I have heard from you. Would it be fair to say that if you are deeply passionate about something, it fires your creative juices musically? Well, I had put troubles behind me, and I wanted to start afresh. I think to keep oneself active (when possible) is always the best way to move forward, and to make a better way of living. Do the best that you can to make this happen. We've mentioned seven of the tracks in this fifteen-track CD. Are there any others that have interesting "roots" that you would like to share with the readers of Piano-Heaven? All my music is an expression of my soul. Montagnola is a special snapshot. While playing the piece Montagnola, the longest track on the record, I really felt like I was flying over hills on a warm summer's night. Gentle and quiet, this track instilled a desire in me to secure peace. And tracks like Dream and Waves of Time go along similar lines. Norwegian Memory is an imaginary journey through the landscape of Norway, but the destination is vague… Thank You for Your Love is for a beloved human being. The very first track that I played and recorded is actually the final track, A New Life- and is true to the motto of Hesse: "Be yourself". Your music has been released on the Real Music Label, which has world-wide distribution but is based in America. To the best of my knowledge, you're the only European artist on their roster, which is a real feather in your cap. How did the relationship with Real Music come about? My first record deal was with the Erdenklang label, and the founder, Ulrich Ruetzel, had good contacts with different Labels in the USA too. So when he visited the United States in the early nineties, he secured an agreement with the Real Music company, initially to release my very first record, Flowing, and this was instantly a hit in the States and paved the way for further releases. For my final two questions, we're going to reminisce and then look forward! So, when did you first start playing the piano? Were you formally trained? Do you play any other instruments? 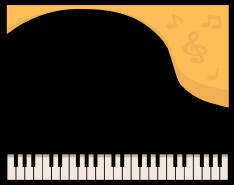 Is the piano your preferred instrument or does it depend on the subject matter? Can you talk a little about your first "break"- i.e. the first time you realised that you could make a career with your music? Who were (if any) your musical influences? I started playing the piano at 15. I received classical lessons, but I quickly started to improvise and began to compose little pieces. At the same time, I played the trumpet in a marching band, and started to play the drums, percussion, guitar and bass-guitar. I played in local bands. The piano is actually my main instrument. I like synthesizers and electric pianos too, but it’s very importand for me to compose sometimes on other instruments as well, or only in my head; you can take an acoustic guitar anywhere, for instance, and therefore you are more independent. My first real "break" in music I had when I was sixteen. The German rock legend Kraan had a gig in our region during the Summer of 1973. I will never forget that; I was totally absorbed by the music, and from then on I knew I must be a professional musician. In the Summer of 2006, the Kraan keyboardist was taken ill one day before a big festival, and they asked me to step in for him. So I performed for the first time in two festival gigs with Kraan; it was really great. I’m influended by many musicians, such as Bach, Beethoven, Mozart, Ravel, Debussy and many, many more. I love Coltrane, Miles, Weather Report, The Beatles, The Grateful Dead- so many bands of today and yesterday, and music styles like electronica and dance too, actually music in all genres, but with quality. One of the biggest influences for me is Nature. I live in the country, and the landscape is always a good source of inspiration to me. Finally, what next for you? Musically, is there anything you have wanted to try but not yet done so (working with an orchestra, combining different instruments in an album, etc. etc.?) And, sneaking this one in here, when away from the piano / keyboards, what do you do to relax? I am currently working on my next album. It will be a little bit more rhythmical. I play most of the instruments (piano, keyboards, guitar, bass, percussion), but I will add some other instruments too. I’m not sure yet which instruments! It is very important that the music has the right harmonic balance. In my studio, I work with Steinberg Cubase 4, use mainly VST plugins from Native Instruments, and have a view into a green landscape- it’s a perfect ambience. We all need Nature on our planet, each and every one of us is responsible for the well-being of Nature, so I’m glad about organisations too like BirdLife or Nabu. The best way to relax for me is go for a walk in a gentle landscape. Thank you, Bernward, for giving this fascinating interview. Bernward is pictured at the Hesse Museum with curator Regina Bucher in the Summer of 2004. 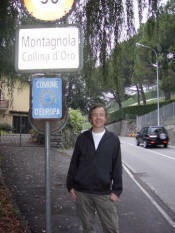 Bernward is pictured outside the town of Monagnola in the Summer of 2004. Bernward is pictured during the Summer of 2007.